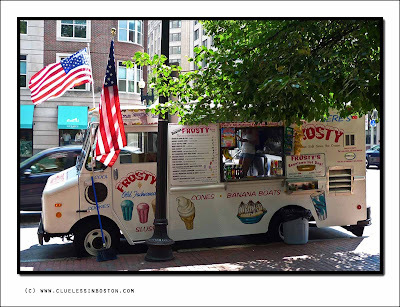 Flying the colors and selling ice cream on a hot day. Always a welcome treat on a sunny day! Curious shot: the wind is blowing only in the middle of the street? Typically american picture! not only because of the flags. We have not such cars selling ices, we only see that in american movies! Wonderful idea for this hot summer! For me a double chocolate okay! Long live Mr. Frosty in August! It's about time you are having some warm weather. Oh yummy! I bet he is doing a lot of business these days. Just had two days in London and watched a couple of these trucks in trouble with the police; I think they were acting without a license and were in prohibited areas. Ice-cream wars can get quite big as the traders fight over 'pitches' in tourist areas. Probably does a good business on a hot day. Tough way to make a living, though. Although there's something to be said for being your own boss. Oh yum! It certainly has been hot enough for them. your picture says enjoy it while it lasts!!! That's "cool". I hope Mr. Frosty has a profitable summer! Nothing like the sight of an ice cream truck!